Cast: Josh Brolin, George Clooney, Alden Ehrenreich, Ralph Fiennes, Scarlet Johansson, and a boatload of others you will recognize including The Highlander! I want to start this off by simply saying, Josh Brolin is today’s Humphrey Bogart. The man knows how to rock a fedora and deliver a knuckle sandwich to any nosebleed who doesn’t know how to treat a dame (more on this in my Gangster Squad review). It’s hard to believe that while Joel and Ethan Coen have managed to tackle westerns, crime, folk music, The Odyssey, even bowling, they have yet to take aim at the very business that has made them so successful for over 30 years, cinema! Hail, Caesar! rectifies this glaring omission in their filmography and as impeccably as one would expect. Hail, Caesar! has a plot, but that’s not why it’s good. Basically, the film follows studio executive, Eddie Mannix (Josh Brolin) as he attempts to keep his talent in line by covering up scandals and fixing production mishaps. The film’s title is a reference to Mannix’s big-budget prestige picture for the studio starring mega-star Baird Whitlock (George Clooney) that tells the “story of the Christ.” When Whitlock suddenly goes missing, Mannix searches the studio lot for clues to his whereabouts. Like I said, the key to this film is not the plot. Like most classic cinema, the plot is a device to direct the entertainment. The Coens revel in the glory days of cinema as Whitlock’s disappearance leads Mannix to wander from studio set to studio set and consequently from beautifully staged genre scene to beautifully staged genre scene. Hail, Caesar! gives the Coens license to film Gene Kelly- style musical numbers, Gary Cooper-style western scenes, Esther Williams-style synchronized swimming spectacles, and high society dramatic capers all within the context of one goofy plotline. Furthermore, the screen is filled with trademark quirky characters, some of which look to be lost from a Wes Anderson movie (I’m talking to you Ralph Fiennes!). Still, an important consideration is that my admiration for this film has little, almost nothing, to do with the characters or the actors. The closest thing to a classic and fully developed character comes in the form of Alden Ehrenreich’s role as a Gene Autry-type western actor named Hobie Doyle who is forced into a role that is way out of his comfort zone. His battle with the phrase, “Would that it were so simple” is very enjoyable. Otherwise, the reason to see this film is for its harkening back to the classic days of cinema through the lens of the Coen brothers. The all-star cast may get people in the seats, but this film will disappoint if you are expecting to spend much time with some of your favorite movie stars. In fact, recognizable faces are strung together in such a way that once one actor goes off screen another comes in; it’s like a wack-a-mole of Hollywood stars. Put simply, this is a movie for people who have a fondness for the art and presentation of the movies themselves. If your ears perk up when a character is introduced as “Carlotta Valdez,” then this is a movie for you. Hail, Caesar! is rated PG-13 and has a running time of 1 hour and 46 minutes. This is a picture that says, “Listen, you! You’ll sit there and watch if you know what’s good for ya!” Next thing you know, there’s a guy getting ripped in half, just so you get the message. Mickey Cohen is the guy who sends that telegram, and he’s played by Sean Penn who met ‘the top’ one day and decided to go over it, way over it. 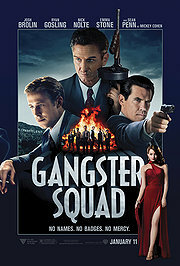 Just so we’re clear though, that’s just what’s needed to make Gangster Squad tick. Cohen owns LA, but goody-two-shoes Sgt. O’Mara (Josh Brolin) has other plans for the City of Angels. He’s had enough of this sucker’s drug running, cop buying, and lady trafficking and looks to put an end to it. Problem is, his bird needs a husband not a hero, and what’s more – she’s got company on the way (baby O’Mara). Off the books, Chief Parker (Nick Nolte) says O’Mara’s got to round up a squad Ocean’s Eleven style complete with tough guy Rocky Washington (Anthony Mackie), tech-man Conway Keeler (Giovanni Ribisi), sharp shooter Max Kennard (Robert Patrick), and sidekick Navidad Ramirez (Michael Pena). Not to mention Wildman Sgt. Jerry Wooters (Ryan Gosling) who’s “poaching the king’s deer” in that he’s got an eye on Mickey’s girl Grace (Emma Stone).